Goldilocks and the Wild Bears: Children’s Nursery Rhymes are another rich source of inspiration for some of the best video slot games on the market today – try another of Quickspin’s recent releases, Big Bad Wolf, or NetEnt’s Jack and the Beanstalk, to find out more. 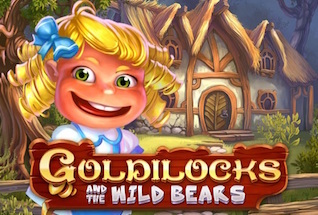 Quickspin have followed up on 2012’s original Goldilocks slot with this 5 Reel and 20 Payline game that comes with Free Spins, expanding wilds and some very special multiplier wilds. Of course, the game also features some pretty special artwork that could take you back to reading bedtime stories as a kid. Like all Quickspin slots, the illustrations and animations are first class. The Goldilocks and the Wild Bears slot RTP is a very decent 97.09% and the game has a low to medium volatility rating, meaning it will pay out fairly regularly, if in small amounts. Chasing those bigger payouts could be hard work here, though having said that there are some promising multipliers available and a 1000x stake win for 5x wilds in a payline. Quickspin’s Goldilocks and the Wild Bears is available to play for free or play for real on your desktop, mobile or tablet. You can play right now at one of our favourite sites, Casumo Casino, or read on for our full game review, including an explanation of all the features and bonus rounds. So, we all know the story of Goldilocks and the Three Bears. But what about those Wild Bears (Wild, get it?). Well, anyway, as you would expect, all the characters from the book are here. The backdrop to the reels is the woods that the house is set in. The symbols are made up of the usual cards, Nine through to Ace, then a stuffed toy bear, baby bear, mummy bear and daddy bear who pays out the most. There is also a standard wild – the three bears house – a multiplier wild – a bowl of porridge – and a scatter – Goldilocks herself. 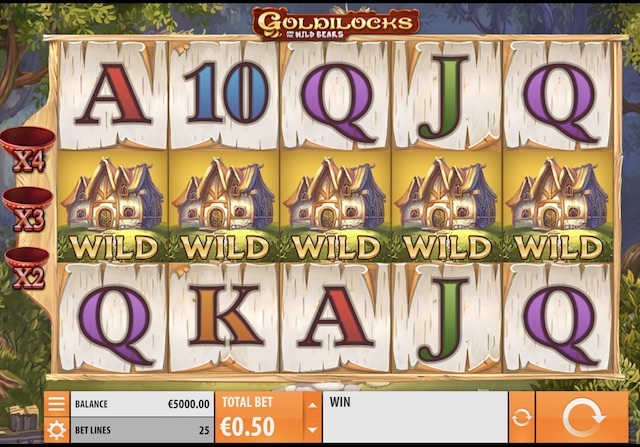 Like all Quickspin slots, Goldilocks and the Wild Bears comes with a standard interface that is easy to get used to. Use the Settings icon at the bottom right to toggle sound on and off, set the Space bar on your keyboard as the Spin trigger (nice touch), and set the Intro screen to appear at the start of the game (or not). You can also, of course, set your bets from 25p to £100. Right, ready to go? Here’s where the fun starts. Wilds: The standard wild (the house) does exactly as you would expect, substituting in for any other symbol to create a winning pay line. The Multiplier Wild is a fun alternative, that does what the normal Wild does, but also adds a 2x multiplier to your win. If two wilds make up the line then you get a 3x multiplier, and if three wilds make up the win line, then you get a 4x multiplier. Free Spins: The Goldilocks scatter symbol needs to land in three positions anywhere on the reels to trigger the Free Spins round featuring 10 spins. During this bonus round you can add more Free Spins with the Bears Turn Wild feature. This is triggered by the Goldilocks Progress Scatter Symbols – a new version of Goldilocks, with her tounge sticking out! Three of these turns Daddy Bear Wild, Five turns Mummy AND Baby bear wild AND adds two free spins each. The wilds remain ‘turned’ for the full Free Spins round. This is where the real fun and the chance to win some decent cash lies – if you can hit all three bears wild, with a few extra spins, you can drive a nice windfall. Quickspin have delivered some really great games in recent years so it’s no surprise that when they returned to the Goldilocks story in 2017 they found a way to make this game even more fun and exciting. The highlight if definitely the Free Spins and Bears Turn Wild round, but even the base game has a lot to offer, and those graphics just top off what is a quality video slot game. Highly recommended!